A Matter of Life and Death is the fourteenth studio album by English heavy metal band Iron Maiden, released on 25 August 2006 in Italy and Finland, and 28 August worldwide, excluding the US, Canada and Japan on 5 September. It is the first album in Iron Maiden's career to enter the US Billboard charts in the top 10, achieving significant chart success in many other countries as well. While not being a concept album, war and religion are recurring themes throughout, as well as in the cover artwork. The A Matter of Life and Death Tour was the tour in support of the album, during which they played the record in its entirety. Iron Maiden began writing new songs near the end of 2005, after a break following their hugely successful festival dates in the US and Europe during the Eddie Rips Up the World Tour. After taking time off over Christmas, the songs were completed and the band began recording at Sarm West Studios, London, with their regular producer, Kevin Shirley. To provide a more "live" sound, the album was not mastered. Producer Kevin Shirley said, "Spoke to 'Arry (Steve Harris) on Friday, who has decided against mastering the Iron Maiden album... It means that you will get to hear the new album exactly as it sounded in the studio, no added EQ, compression, analogue widening, etc., and I must say, I am pretty happy with the end result." Iron Maiden during the A Matter of Life and Death Tour, in which they performed the album in its entirety. Speaking to Metal Hammer in September 2006, lead vocalist Bruce Dickinson commented that "Everyone was up for pushing things as far as they'd go, but the record was so easy to make." Dickinson went on to claim that they "finished the record with two months to spare," with Harris adding that "A lot of what you hear are first time takes." Speaking about the record's musical style, Harris states that "It is heavier than we've ever been, but also very progressive. And I don't mean that in the modern sense, but like Dream Theater, more in a 70s way." This is the band's fourth studio record not to share its name with a song, following Piece of Mind, The X Factor and Virtual XI. Drummer Nicko McBrain and guitarist Janick Gers claim that the band originally intended to name the album after one of its tracks, with both "The Pilgrim" and "The Legacy" being considered. According to Gers, "sometimes a title will just leap out at you as the obvious choice, but it didn't this time for some reason," so the band decided on A Matter of Life and Death, which, according to McBrain, was amongst "two or three ideas which we were kicking around." Neither Gers or McBrain can remember who came up with the title, which they state was thought up by either Harris, Rod Smallwood (the band's manager) or "Drew" (an engineer at Sarm West Studios). The album cover was created by Tim Bradstreet, an American artist, best known for his work on the Hellblazer and Punisher comics. A life-long Iron Maiden fan of the band who drew much influence from Derek Riggs' artwork for them, Bradstreet described the opportunity as "one of my wildest dreams". He had a tight schedule, receiving for reference the songs to listen to and key art done by Peacock Designs UK, who directed the booklet's artwork. Along with redrawing a few of the original elements - which featured the tank which Bradstreet described as "Korean War era but with a twist" as the gun barrel is patched over from another vehicle - Bradstreet added Eddie the Head as a general leading an army of skeletons. Bradstreet's colourist partner Grant Goleash finished the art, which was then retouched by Peacock. The back cover would originally feature Eddie shot on the back, but then the band opted to instead feature a detail of the tank icon featuring Eddie's head along with crossed guns. 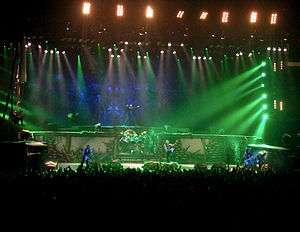 During the 2006 leg of the A Matter of Life and Death Tour, Iron Maiden performed the album in its entirety, which received a mixed response. The band still supports their decision to play the record in full, with McBrain commenting that "I think that this is the best album I've ever made with this band" and that "a lot of people [were] very happy to hear this album in its entirety," while Dickinson says that doing so contributed to the fact that "the fans are attracted to us because we are still an active musical force." The first single to be released from the album was "The Reincarnation of Benjamin Breeg", released on 14 August 2006. On 10 August, "Different World" was made available for public streaming on the band's website, as was "Brighter than a Thousand Suns" the following day. "Different World" was the second single, receiving airplay on many rock radio stations. The song also features an animated video, similar to that of "Wildest Dreams". In addition to the standard CD release, A Matter of Life and Death was also released in a limited edition version which contains a bonus DVD. The DVD, which has a total runtime of nearly one hour, contains a half-hour documentary, plus videos and photos all shot while the band were making the album. The documentary, entitled "The Making of A Matter of Life and Death", directed by Matthew Amos (director of The Early Days and Death on the Road DVD documentaries), features candid video footage shot largely by Kevin Shirley himself during the recording of the album giving a behind-the-scenes look at life in the studio. The bonus DVD also features the full video promo for "The Reincarnation of Benjamin Breeg", and a special filming of the band recording "Different World" in the studio. The album was also released as a limited edition double picture disc vinyl in gatefold sleeve, and as a digital download. The album was met with very positive reviews. Metal Hammer rated it 10 out of 10, stating that "Iron Maiden have utterly surpassed themselves" and that "it makes for a riveting listen." Sputnikmusic also gave it full marks, commenting that "A Matter of Life and Death contains everything fans want to hear; be it exciting, Maiden-style story telling; aggressive riffs; impressive solos; or melodic harmonies." BBC Music praised the band for "their uncanny ability to write great lyrics wrapped around guitar orchestration that rock fans crave," concluding that "In this world of hopeless auto-tuned mediocrity here is a British band that consistently crafts fantastic music that surprises reviewers and fans alike." IGN awarded it 8.3 out of 10, praising the album as "the crew's best release since Piece of Mind." PopMatters rated it 8 out of 10, deeming it "their most focused record since 1988's Seventh Son of a Seventh Son, one that eschews crowd-pleasing anthems in favour of massive, sprawling compositions." Classic Rock gave the album a score of 9 out of 10, stating that "it's not only Maiden's best since the 80s but quite possibly their finest release since 1983's Piece of Mind," and awarded it "Album of the Year" at the 2006 Classic Rock Roll of Honour Awards. Rolling Stone gave the album 3 stars out of 5, finding the music and lyrics "relevant," although also claiming that "the songs now march where they once galloped," implying that the band is "ageing gracefully." AllMusic were also less positive, rating it 3.5 out of 5 and commenting that it is "a more elaborate and meandering experience than [its predecessor] Dance of Death, but a rewarding one for fans willing to indulge the group's occasional excess." Adrian Smith – guitar, guitar synthesiser on "Brighter Than a Thousand Suns"
On 14 September, Iron Maiden released an update which stated that "in just the first week the new album has shipped over a million copies worldwide and impacted on the charts pretty well everywhere in the world". This was their first album to chart in the top ten in the Billboard 200, reportedly selling 56,000 units in its first week. Debuting at No. 4, it was the highest-charting rock album ever in India, until their fifteenth studio album, The Final Frontier, which debuted at No. 1. A Matter of Life and Death also achieved gold status in Finland in its first week, the band's eighth from the country. 1 2 "Iron Maiden Announces Special Album Format". Blabbermouth.net. 3 August 2006. Retrieved 18 August 2013. ↑ "Kevin Shirley diaries- March 2006". Kevin Shirley. Archived from the original on 12 August 2008. Retrieved 19 October 2011. ↑ "Kevin Shirley diaries- May 2006". Kevin Shirley. Archived from the original on 9 September 2010. Retrieved 19 October 2011. 1 2 A Matter of Life and Death (Media notes). Iron Maiden. EMI. 28 August 2006. ↑ "A Matter of Life and Death kills the charts worldwide!". ironmaiden.com. 11 September 2006. Retrieved 17 September 2006. 1 2 "Iron Maiden Drummer, Guitarist Talk About New Album". Blabbermouth.net. 5 July 2006. Retrieved 17 September 2006. 1 2 "Iron Maiden Talk About New Album". Blabbermouth.net. 22 June 2006. Retrieved 6 October 2014. ↑ "Caveman's Diary – July 2006". Kevin Shirley. Retrieved 9 November 2010. ↑ "Iron Maiden Bassist Decides Against Mastering New Album". Blabbermouth.net. 9 July 2006. Retrieved 5 August 2010. ↑ Dome, Malcolm (September 2006). "Iron Maiden: War all the Time". Metal Hammer (157): 34–40. ↑ "BREAKING BREAD WITH IRON MAIDEN". Tim Bradstreet. 5 July 2006. Retrieved 22 September 2011. ↑ "Iron Maiden- Cardiff review excerpt". Blabbermouth.net. 12 December 2006. Retrieved 19 October 2011. ↑ "Iron Maiden Guitarist on Current Tour: 'It's Just A Lot Of Great Fun Playing These Songs'". Blabbermouth.net. 20 October 2006. Retrieved 19 October 2011. ↑ "Iron Maiden Drummer Defends Band's Decision To Play Entire New Album Live". Blabbermouth.net. 14 October 2006. Retrieved 19 October 2011. ↑ "Bruce Dickinson: 'We Don't Want To Look Like Our Own Version Of An Iron Maiden Cover Band'". Blabbermouth.net. 21 September 2006. Retrieved 19 October 2011. ↑ "Iron Maiden 'The Reincarnation of Benjamin Breeg' Single Artwork Revealed". Blabbermouth.net. 29 July 2006. Retrieved 24 November 2012. ↑ "Iron Maiden: New Track 'Different World' To Premier Tonight". Blabbermouth.net. 10 August 2006. Retrieved 24 November 2006. ↑ "Iron Maiden: Another New Song Posted Online". Blabbermouth.net. 11 August 2006. Retrieved 24 November 2006. 1 2 "Iron Maiden Celebrates World Tour With Release of Ultimate Tour Souvenir Single". Blabbermouth.net. 23 November 2006. Retrieved 24 November 2012. ↑ "Iron Maiden 'Different World' Lands on Billboard's 'Hot Singles Sales' Chart". Blabbermouth.net. 7 December 2006. Retrieved 18 August 2013. ↑ Bowar, Chad. "Iron Maiden – A Matter of Life And Death Review". About.com. Retrieved 1 August 2012. 1 2 Maclarty, Andy (8 September 2006). "Iron Maiden – A Matter of Life And Death Review". BBC Online. Retrieved 29 March 2012. ↑ Kaye, Don. "Iron Maiden – A Matter of Life and Death". Blabbermouth.net. Retrieved 23 November 2012. ↑ Henderson, Tim. "Iron Maiden – A Matter of Life And Death". Brave Words & Bloody Knuckles. Retrieved 16 September 2012. 1 2 Dome, Malcolm (September 2006). "The Good Life". Classic Rock (97): 76. ↑ Collis, Clark (1 June 2006). "A Matter of Life and Death Review". Entertainment Weekly. Retrieved 1 August 2012. ↑ "Iron Maiden – A Matter of Life and Death". Exclaim!. Retrieved 18 September 2012. 1 2 Thompson, Ed (3 November 2006). "Iron Maiden – A Matter of Life and Death". IGN. Retrieved 29 March 2012. 1 2 Milas, Alexander (September 2006). "Be All and End All". Metal Hammer (157): 91. 1 2 Begrand, Adrien (6 September 2006). "Iron Maiden: A Matter of Life and Death". PopMatters. Retrieved 29 March 2012. ↑ Stagno, Mike (27 August 2006). "Iron Maiden – A Matter of Life and Death". Sputnikmusic. Retrieved 15 June 2011. ↑ "Classic Rock 2006 winners". Blabbermouth.net. 7 November 2006. Retrieved 1 September 2011. ↑ Steffen, Chris (7 September 2006). "Iron Maiden – A Matter of Life and Death". Rolling Stone. Archived from the original on 2 May 2008. Retrieved 25 November 2012. 1 2 "Iron Maiden's Steve Harris Is 'Delighted' With Reaction To New Album". Blabbermouth.net. 14 September 2006. Retrieved 25 November 2012. ↑ "Iron Maiden returns to the chart for the first time since 2003". Billboard. 13 September 2006. Retrieved 20 December 2011. ↑ "Iron Maiden kotimaisten myyntilistojen kärjessä". MTV3. 31 August 2006. Retrieved 17 September 2006. ↑ "Iron Maiden – A Matter of Life and Death (album)". ARIA Charts. Australian-charts.com. Retrieved 14 April 2013. ↑ "Discographie Iron Maiden". Ö3 Austria Top 40 (in German). Austriancharts.at. Retrieved 18 October 2011. 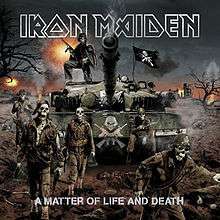 ↑ "Iron Maiden – A Matter of Life and Death" (in Dutch). Ultratop. Retrieved 14 April 2013. ↑ "Iron Maiden – A Matter of Life and Death" (in French). Ultratop. Retrieved 14 April 2013. ↑ "Iron Maiden- Billboard albums". AllMusic. Rovi Corporation. Retrieved 18 October 2011. ↑ "Iron Maiden – A Matter of Life and Death (album)". Tracklisten. Danishcharts.com. Retrieved 14 April 2013. 1 2 3 "Discography Iron Maiden". The Official Finnish Charts. Finnishcharts.com. Retrieved 18 October 2011. ↑ "Iron Maiden – A Matter of Life and Death (album)". SNEP (in French). Lescharts.com. Retrieved 14 April 2013. ↑ "Iron Maiden – A Matter of Life and Death". Media Control Charts (in German). Charts.de. Retrieved 18 October 2011. 1 2 3 "Discography Iron Maiden". IRMA. Irish-charts.com. Retrieved 18 October 2011. ↑ "Iron Maiden albums". FIMI. Italiancharts.com. Retrieved 18 October 2012. ↑ "A Matter of Life and Death- Japanese Albums Chart" (in Japanese). Oricon. Retrieved 18 October 2011. ↑ "Iron Maiden – A Matter of Life and Death (album)". MegaCharts (in Dutch). Dutchcharts.nl. Retrieved 14 April 2013. ↑ "Iron Maiden – A Matter of Life and Death (album)". RIANZ. Charts.org.nz. Retrieved 14 April 2013. 1 2 "Discography Iron Maiden". VG-lista. Norwegiancharts.com. Retrieved 18 October 2011. ↑ "OLiS – sales for the period 28.08.2006 – 03.09.2006". OLiS. 11 September 2006. Retrieved 21 November 2011. ↑ "Iron Maiden – A Matter of Life and Death (album)". AFP. Portuguesecharts.com. Retrieved 14 April 2013. ↑ "Iron Maiden Albums". PROMUSICAE. Spanishcharts.com. Retrieved 18 October 2011. ↑ "Iron Maiden – A Matter of Life and Death". Sverigetopplistan. Swedishcharts.com. Retrieved 18 October 2011. 1 2 "Iron Maiden – A Matter of Life and Death" (in German). Swiss Hitparade. Archived from the original on 9 November 2012. Retrieved 18 October 2011. ↑ "Iron Maiden UK Chart History". Official Charts Company. Retrieved 23 November 2012. ↑ "Iron Maiden- Chart History". Billboard. Retrieved 18 October 2011. ↑ "Iron Maiden – A Matter of Life and Death". IFPI Greece. Greekcharts.com. Archived from the original on 10 January 2014. Retrieved 18 October 2011. 1 2 "Discographie Iron Maiden". SNEP (in French). Lescharts.com. Retrieved 18 October 2011. 1 2 "Iron Maiden Single-Chartverfolgung". Media Control Charts. Musicline.de. Retrieved 18 October 2011. ↑ "Iron Maiden – 'The Reincarnation of Benjamin Breeg'". Sverigetopplistan. Swedishcharts.com. Archived from the original on 2 October 2013. Retrieved 27 August 2013. ↑ "Iron Maiden songs". FIMI. Italiancharts.com. Retrieved 18 October 2011. ↑ "Iron Maiden – 'Different World'". Sverigetopplistan. Swedishcharts.com. Retrieved 27 August 2013. ↑ "Top 40 Official Singles Chart UK Archive 6 January 2007". Official Charts Company. Retrieved 18 March 2011. ↑ "ABPD – Certificados" (in Portuguese). Brazilian Association of Phonograph Producers. Retrieved 2 January 2012. ↑ "CRIA Gold & Platinum certifications for October 2006". Music Canada. Retrieved 25 November 2012. ↑ "Musiikkituottajat – Tilastot – Kulta- ja platinalevyt: Iron Maiden" (in Finnish). IFPI Finland. Retrieved 29 August 2010. ↑ "Gold-/Platin-Datenbank ('A Matter of Life and Death')" (in German). Bundesverband Musikindustrie. ↑ "Top 75 Combined Repertoire (Albums): 30/11-06/12 2003" (in Greek). IFPI Greece. Archived from the original on 5 November 2006. Retrieved 17 October 2010. ↑ "IFPI > Guld & Platina År 2006" (PDF) (in Swedish). IFPI Svenska Gruppen. p. 4. Archived from the original (PDF) on 21 May 2012. Retrieved 4 November 2008. ↑ "The Official Swiss Charts and Music Community: Awards 1990". Swiss Hitparade. ↑ "BPI: Certified Awards Search". British Phonographic Industry. Retrieved 19 January 2013.